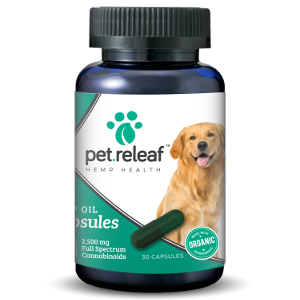 Pet Releaf Hemp Oil Capsules contain an Organic Full Spectrum Hemp Oil which is extracted using a solvent-free super critical CO2 method. This product is perfect for large breed dogs experiencing more severe illness or injuries. It has no known contraindications (won’t interfere with other medications) and has no known negative side effects. At Pet Releaf, we control our entire manufacturing process, from seed to sale, from plant to pet. 100% of Pet Releaf’s hemp is grown at our joint-venture hemp farm located in eastern Colorado. It is the largest Certified USDA Organic hemp farm in the United States and we’re the only pet company they work with! We plant and harvest a specialized proprietary strain of hemp, PR-33, grown specifically with pets in mind. Since we extract a Full Spectrum Hemp Oil, Pet Releaf Hemp Oil provides your pet with the multitude of health benefits associated with CBD while also providing the additional medicinal benefits associated with the over 100 other cannabinoids, terpenes and flavonoids found within PR-33.